There are many reasons we don’t usually do a road trip anywhere at Christmas; it’s always hot, too much traffic, no one wants to take the chance of Santa not finding them, it’s hard to relax and play with your toys if you are in someone else’s home. Also Bev ‘does’ Christmas. And by that, I mean the whole decorated house and yard, presents for all, and the full traditional English Christmas lunch. If we are not all home at Christmas we will have second Christmas, third Christmas, pretend Christmas or fake Christmas depending on whenever she can gather some of her brood around. That our family is so hard to pin down in the same place at the same time is a cause for concern for her and so it is always just easier to be home for Christmas. This year the Ussing side of the family decided Christmas would be celebrated at Graeme’s brother’s home north of Brisbane. Graeme has five siblings, all married with children and some with grandchildren (plus his mum), so this was quite the logistical undertaking. Only four didn’t make it, two working and our two girls, Laura in England and Emma in Japan. If we have time Graeme and I prefer to drive rather than fly and so a Ussing Family Road Trip with our son Adam and his girlfriend Fer (Fernanda) was planned. Fer is Mexican and Australian visas are hard to get so we had only met her once before Graeme and I decided an Aussie camping trip would be a fun way to ease her into the Ussing family before meeting the other 30+ members In hindsight flying would have been so much easier, but we can now say that this young lady can put up with just about anything. With both a rooftop tent and the camper trailer, we felt a bit spoiled for both comfort and storage space. Our first stop as usual, was a supermarket at the border to stock up on fruit and vegies before making camp along the Edward River near Moulamein in New South Wales. Welcome Fer, – to putting up a tent, flies, mosquitoes, cooking on a camp fire and instructions for a bush toilet. A young kangaroo coming into our camp on dusk almost made up for the mosquitoes. Day 2 and it was already hot by the time we packed up camp early in the morning. Adam had wanted to show Fer the Hay Plains. We enjoy this big sky country but wondered how it compared to Mexico City. We stopped in Hay for a swim in the Murrumbidgee River to cool off. There is an excellent sandy swimming area and free camp area with lots of shady trees in Hay. The furnace like heat of the afternoon meant abandoning any thought of bush camping. By the time we got to Cobar the temperature had dropped to 44 degrees (from 46). We unhitched the camper trailer in the caravan park and without even setting up camp headed for the town swimming pool. 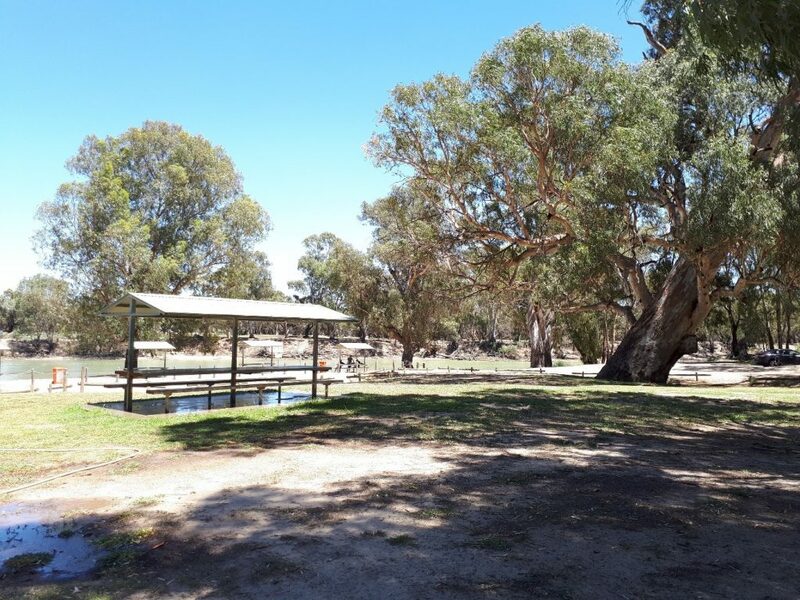 Shady Trees at the swimming area – Hay, NSW. And what a pool! An Olympic size pool with a diving area and spring board, a large under cover pool with a shallow area for toddlers, a water park, large water slide, shaded grassy areas and a kiosk doing a brisk trade. Apart from a cool shower and toilet that flushes, the best thing about a caravan park in summer is the camp kitchen where you can put all your water bottles in the freezer overnight. Our 12v fridge has never coped well in the heat and after 13 years it is feeling the effects of old age as well. Knowing the next day was forecast to be just as hot we altered course depending on where we thought we could find the best pool to cool down in at the end of the day. Moree with its artesian pools sounded like just the place. Even knowing that the water is awfully hot straight out of the ground we were banking on a ‘cool pool’ somewhere. We found it at the Mehi River Van Park. A hot artesian pool, a cool artesian pool and a conventional swimming pool. We swam before and after tea and again in the morning before we left. The next day we headed towards Dalby. After a couple of small mishaps requiring the use of our winch, the first time we have ever used a winch on any 4WD expedition, we set up a late camp at Cecil Plains. 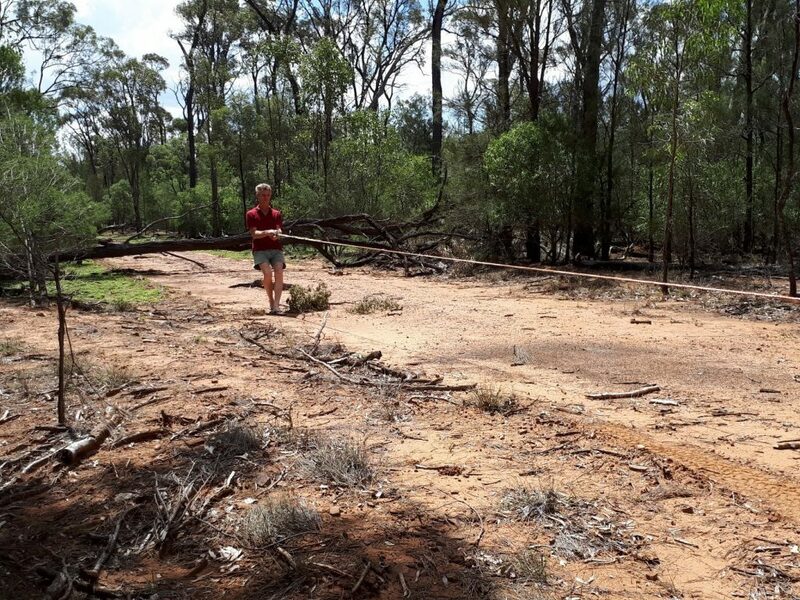 Graeme unwinding the winch cable to remove a tree that had fallen across the track. I don’t think I have ever seen so many mosquitoes, except maybe at Kakadu. They descended in clouds. This was not such a problem for our tough skin but Fer was coming out in huge red welts with every bite. We sat Adam and Fer under a mosquito net to eat. Adam was wearing jeans but where his knee had touched the net, he had 18 bites to show the next morning. 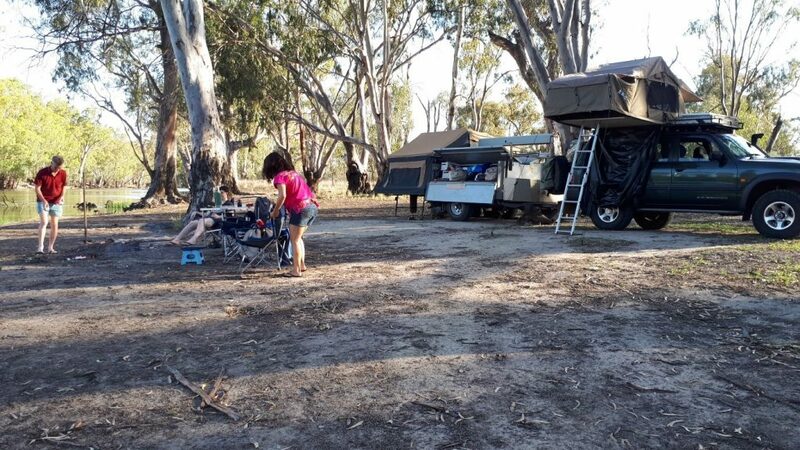 Cecil Plains has a great free camp area; quiet, grassy and level, but oh those mozzies! The next day we reached our destination – Poverty Creek Campground on Bribie Island. Despite the name, this is a lovely campground. There is a large camp area with space for families and larger groups to camp. The seven kilometres of deep sand on the track to get to the campsite possibly deters those who are not serious about bush camping and so the campground was relatively quiet. 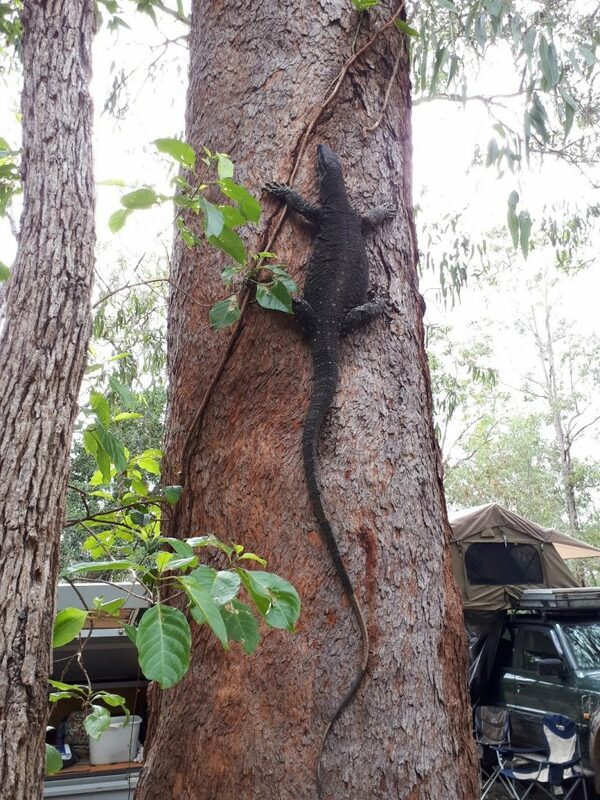 Lace monitors in the camping area at Poverty Creek. In the camp ground there was plenty of wildlife to watch and take photos of – the funniest was watching the bush turkeys. One had a strong dislike of the many lace monitors roaming around the camp. The turkey would stalk up behind, turn around and proceed to scratch dirt and leaves over the hapless lizard. The monitor would put up with this for a few minutes before waddling off, only for the whole performance to happen again a couple of metres away. I counted the kangaroos on the track to the campground one night – 28 between the bridge to the island and our camp. According to the brochures there are also bettongs, pottaroos and koalas on the island but we didn’t find any. If there was a Poverty Creek we didn’t find it so the mosquitoes weren’t too bad here. Fer found a bull ant, but only after it had bitten her. We tried to tell her she had now passed the Aussie bush camper entrance test, but I don’t think it was much consolation. Bull ant bites hurt. Our Christmas lunch was a traditional hot meat and vegies meal. I always thought it was strange to have a hot meal on Christmas day in Victoria, but it is even more strange in Queensland to be sitting outside in the shade eating a huge hot meal. Our evening meal was just as traditional – leftover meat and salads. 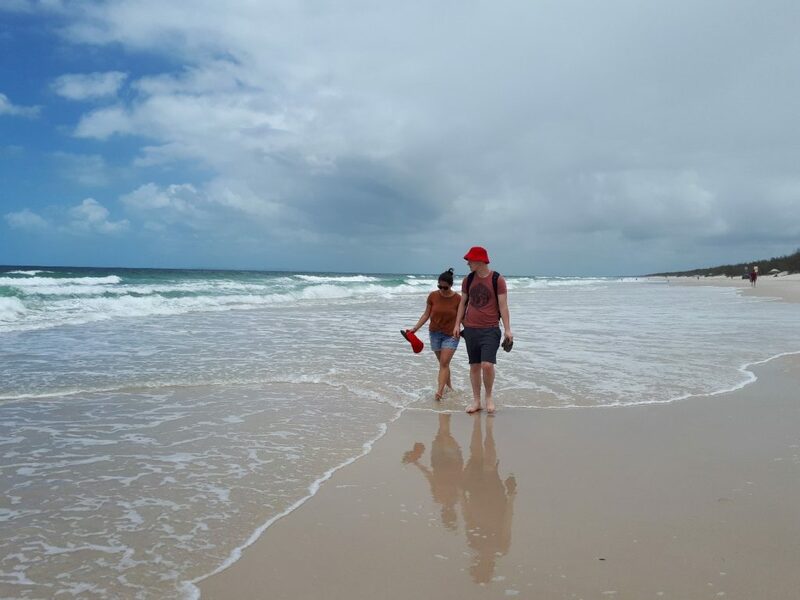 Bribie Island is a great place to visit, especially if you have kids. There are surf beaches on one side of the island, are sheltered by Moreton Island to the east and on the other side of the island are the calmer waters of the Pumicestone Passage. Chistmas morning – Bribie Island. We had a great few days with Graeme’s family. While the family grows, the opportunities to get everyone together seem to be diminishing. Leaving Bribie, we travelled to Texas and stayed just south of the border…because we thought that would be a funny Mexican thing to do. 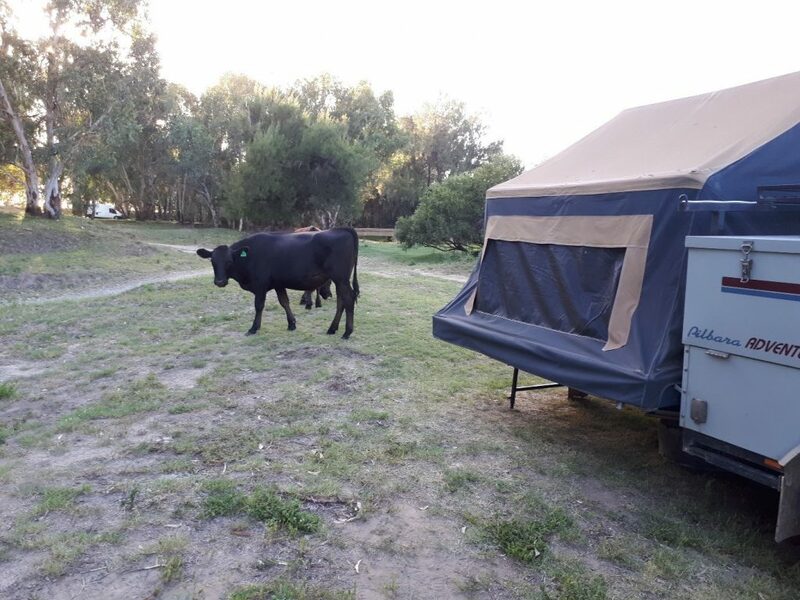 Our camping neighbours – Texas, Qld. Fer had found out that the rest of her family were flying to New York to celebrate New Year’s Eve. Not to be outdone, we decided we would make our way to Dubbo for NYE where there were fireworks and family entertainment planned for the evening. First though we had to camp near Coonabarabran so Adam could visit the Siding Springs observatory and visitor’s centre. He is studying physics at uni and tells me things like how the visual telescopes at Siding Springs are more exciting than radio telescopes (like Parkes) and all manner of other things about space that I don’t understand. We then headed to Dubbo, first making sure that the chosen caravan park had a swimming pool. Our picnic and chairs were packed for the evening’s entertainment and Fer and I headed for a shower before heading out. We came out of the amenities block to find the sky had turned an eerie reddish colour. We just had time to get to our camp as the dust storm hit. Fortunately, Adam and Graeme had been at our campsite and had most things pegged down or packed up. Our NYE was spent holding down our tent by sitting inside playing cards (teaching Fer how to play 500). The fireworks were cancelled – they will be rescheduled, probably on Australia Day. We raided the picnic food to find 12 grapes for each of us. A Mexican tradition is that you eat one grape each time the church bell tolls at midnight on NYE and make a wish for each grape. You have to keep up though. One ring, one grape, one wish – otherwise they won’t come true. This was going to be achievable. We could hear the bells from the nearby Catholic Church throughout the evening. Our biggest problem wasn’t that the bells started ringing at 11.58, it was that allowing time to swallow a grape between rings didn’t seem to be a thing in Dubbo. Who would have thought? Turns out that thinking of 12 wishes while trying not to choke on grapes is not that easy. In fact, once you have done the usual health, happiness, wealth, happy kids it is not that easy to come up with new wishes. 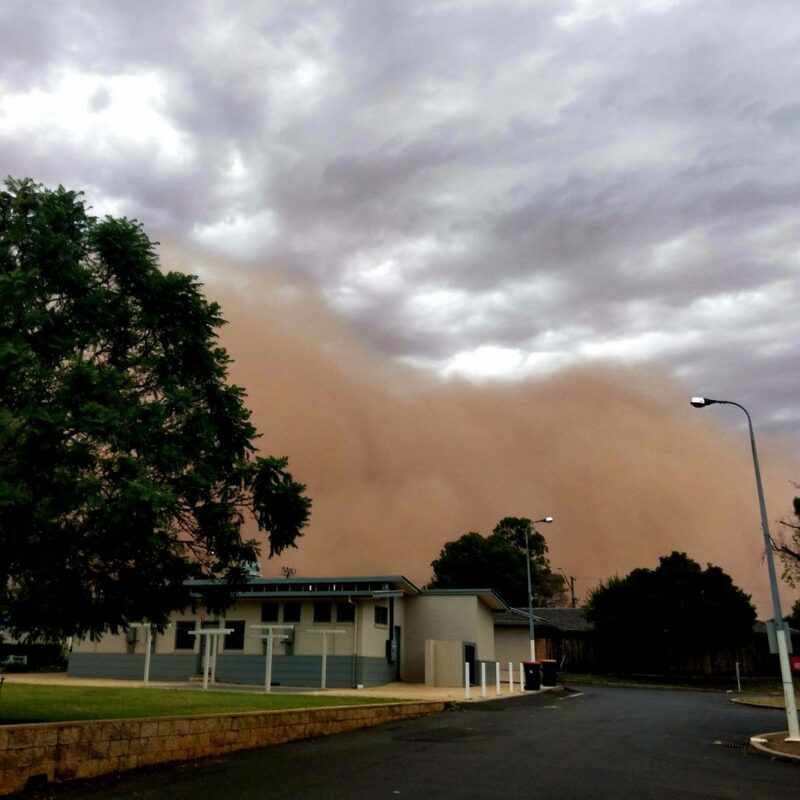 The dust storm rolling into Dubbo. 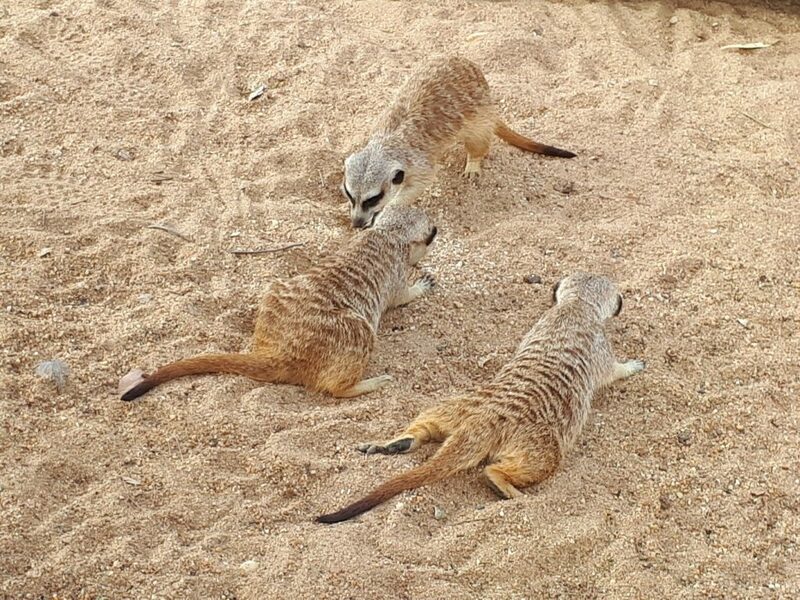 We spent the next couple of mornings at the Taronga Western Plains zoo and the afternoons in the swimming pool. With temperatures in the low 40s every day, except when we were at Bribie Island where it was a balmy 35, swimming pools dominated our thoughts and our camping choices. Sometimes we should just take our cues from the animal world and when it’s hot find a spot in the shade, dig a hole and lie belly down in the damp sand. From Dubbo we headed to Parkes to check out the radio telescope. It might be Adam’s second preference for studying the universe, but it is still a very impressive structure. When we were there the ‘dish’ was being used in a research project searching for gravitational waves to prove Einstein’s theory of relativity. Adam explained how this works but like at Siding Springs the information just passed through my brain like the vacuum of space itself. We went on to Forbes that evening ….because the caravan park had a better looking swimming pool. There was a bit of lightning around so we made use of the camp kitchen to cook an evening meal. This turned out to be a fortuitous decision as we were hit by a thunderstorm; complete with lashing rain and wind. We were very lucky that both the tent and the camper trailer stayed waterproof. The strange thing about the thunderstorm was that the temperature didn’t drop. You can usually count on a cool breeze after a storm, but this night remained steamy hot. We consulted the weather gurus (Bureau of Meteorology) and as it was going to be a pleasant 39 the following day but 45 degrees the day after we decided to put in a big day and drive from Forbes to Nhill. It was a big day, but we had a good break in Elmore at Graeme’s mum’s house, getting home at midnight. As we all lounged around the following day, we agreed it had been worth the drive, both to Bribie Island for Christmas and to be relaxing under the air conditioner when it was 45 degrees outside. Several lengthy games of 500 were played…with Graeme and I being thoroughly beaten. Time to move onto Rummikub or Monopoly! The Ussing camp set up, camper trailer and rooftop tent.